- "Seizoen 2012-2013" is written on on the inside of the collar. - "Trots van het noorden" (Pride of the north) is written on the back of the collar. - The Groningen provincial flag is located on the bottom front left of the shirt. Before buying this shirt I had never heard of Klupp. Based on this one shirt I have of theirs, I would say that they make pretty good shirts. The colour combination is OK. It's not dreadful but they don't jump out at me. 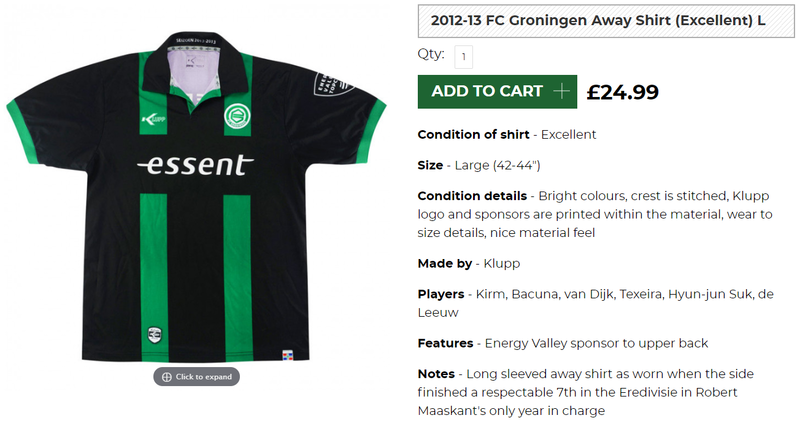 I like that the Groningen provincial flag is located on the front of the shirt. I'm also a fan of the club motto being located on the back of the neck. These personal touches are what elevates this shirt from receiving an average rating to a more positive one. Having no other teams of a similar size in its nearest proximity, Groningen lacks traditional rivals. SC Veendam was the nearest professional team to Groningen until the club dissolved in 2013, but as Groningen and Veendam were in different divisions during most of their histories, and Veendam had a significantly smaller following, a strong two-sided rivalry never developed.